Who Were the Initial Stone Carvers of the Colorado Plateau? 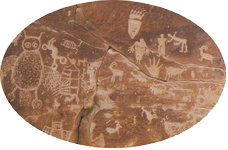 There are several different prehistoric and historic peoples involved in the history of rock art. Spanning from 10,000 BC through A.D. 1880 many different markings have been left on large boulders and canyon walls across the country. We will talk specifically about the area surrounding the Colorado River as it runs through Moab, Utah and investigate the tribes and styles of stone carving found in this region. On the Colorado Plateau the earliest evidence of rock art is thought to be carved during what is known as the Archaic period. This period spans from approximately 5,500 B.C. to A.D. 1. There were a couple different styles of carvings left during each of the time spans we will discuss. The first type consists of zig zag and parallel lines, dots, circles and other kinds of non-specific shapes. This style of rock art is called Abstract. The other style of carving consists of ghostlike body forms, headdresses, animal and plant forms. This style is known as Representational or Barrier Canyon Style. The next peoples to leave their mark on the Colorado Plateau would be the Anasazi. The word Anasazi literally translated means the ancient ones. They inhabited the area from A.D. 1 to A.D. 1275. 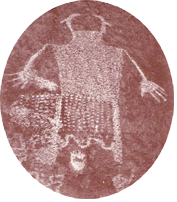 Their Representational style consisted of a variety of human forms also known and Anthropomorphic forms with earrings, headdresses, handprints, paw prints, birds, spirals, bighorn sheep, shield like images, deer and the well known Kokopellis in several different styles. They too left some Abstract designs consisting of different combinations of parallel and wavy lines, meanders and other vague shapeless carvings. The Fremont also inhabited the Colorado Plateau for part of the time that the Anasazi were there. The Fremont existed on the plateau from about A.D. 450 to around A.D. 1250. Their Representational carvings were slightly different than the Anasazi. Their human forms or Anthropomorphic forms have wider shoulders and are more trapezoidal or square in shape. The human forms are filled with abstract decorations while the exteriors were adorned with elaborate headdresses and ear bobs. Like the Anasazi the Fremont people did stone carvings of deer and bighorn sheep, too. This overlap of existence between the Anasazi and Fremont people is called the Formative period and spans from A.D. 1 to A.D. 1275. The final group we will discuss is the Ute tribe. They existed on the plateau from approximately A.D. 1200 to approximately A.D. 1800. Their Representational carving consisted of human forms both on foot and on horseback, there were many hunting and warfare scenes as well. 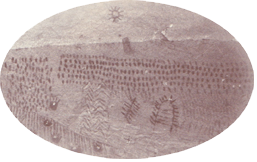 There are also many carvings of horses with no riders as well as bison and other animal figures. We know that carvings depicting bows and arrows were done most likely after A.D. 500 because this is time period that is generally accepted for their appearance while carvings depicting horses are thought to be done after A.D. 1540 because is when the Spaniards reintroduced the horse to the new world. All these different peoples left their mark on the Colorado Plateau and gave a special gift for all of us that have followed them. To see the different designs is always a treat but when we have some knowledge of who left these stone carvings and when they were done it makes it all the more enjoyable and we are able to feel more connected to our past. This article was published on Friday 19 November, 2010.